Set a comal, griddle or ungreased dry skillet over medium heat for at least 8 to 10 minutes, until very hot. Meanwhile, cut 2 circles about the size of the tortilla press plates out of thin plastic bags, such as produce bags from the grocery store. In a large mixing bowl, mix together the corn tortilla flour, salt and the water and knead in a circular motion. It should feel smooth and without lumps, like Play Doh. Though, it shouldn’t be too wet or sticky. If it doesn’t feel smooth and feels coarse when you attempt to make the masa balls, add a bit more water. Masa dries out fast, so if you leave it unattended, cover it with a clean moist kitchen towel or cloth. To make the tortillas, one by one, make dough balls of about 1 1/2-inch in diameter. Place one plastic circle on the bottom of the tortilla press and place the masa ball on top. Place the other plastic circle on top of the ball and clamp down the press to make a flat disk. As you clamp down the press, jiggle it a little as you are getting to the bottom, this makes for a rounder tortilla. It should be about 5-inches in diameter and about 1/8-inch in height. If the edges of the tortilla seem cracked and jagged, the dough needs a bit more water. Once you have a tortilla with smoother edges, you are set. (Alternatively, you can place a ball of dough between two plastic pieces and roll the tortillas out with a rolling pin). Open the press, take the top plastic off, lift the bottom plastic with the tortilla in one hand and peel the tortilla from the plastic with the other hand. I peel it with my right hand, as I am right handed. Lay it on the griddle, skillet or comal softly, but swiftly. Once the tortilla is on the hot surface, don’t touch it for the next 30 seconds! Even if it didn’t lay completely straight, resist the temptation to fiddle with it. Let it cook until it can be flipped without sticking to the comal, just like pancakes, or until a spatula can easily lift it. Another sign that it is ready to be flipped, is it becomes opaque on the side that it was cooking on. Turn over, and cook for a minute, until opaque and starting to get brown freckles on the side that is now on the hot surface. If it is opaque but it has white-ish areas, you need to leave it a bit longer until it becomes freckled with brown spots. Turn over once more, and now after 10 to 15 seconds, the tortilla should puff up like pita bread, if not all over tortilla, at least in an area of it. If it is not puffing, gently tease it by poking with your finger softly in an area of the tortilla around the center. Once it puffs, let the tortilla cook for another 15 to 20 seconds, so that it cooks internally in the puffed up area. That is the difference between ok tortillas, and to die for, malleable, fully cooked, soft tortillas. 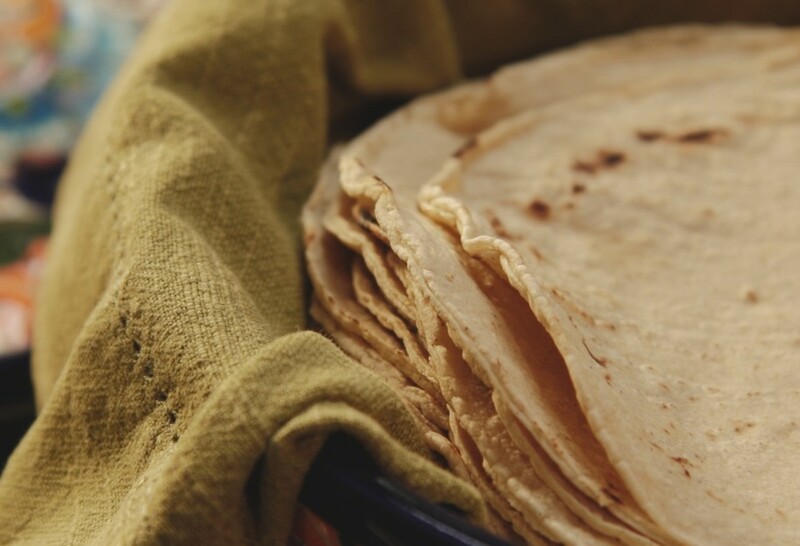 Transfer each cooked tortilla to a clean kitchen towel or a cloth-lined tortillero. If eaten that same day, tortillas may be kept wrapped in a clean kitchen towel or cloth. If not, wrap in a kitchen towel, place inside a closed plastic bag, and store in the refrigerator. They will keep for up to 3 days, afterwards they will turn too hard. Reheat on hot comal for 30 seconds or so on each side before eating. They can also be frozen and kept for months. I am just failing at making tortillas. I keep trying but they don’t puff up and it is taking so long for them to get brown freckles that they become over cooked and dried out. Do you have a video? I know this is suppose to be an easy thing so I don’t know why I can’t get it right. Hi Pati, what brand of tortilla flour do you prefer? love your shows , Pati ! … they inspire me !! keep them coming ! I had grilled some Chicken the other day and wanted to make some type of soft tacos with it. I decided to try to make corn tortillas from scratch. I saw your website and have watched your show quite often. These are so easy and turned out very good. Thank you for the recipe and I will be trying some more too. I am so thrilled you liked the recipe, Scott!! Hi, I make my corn tortillas all the time now. I found out the secret. Mix and cover bowl with towel for one hour. They turn out perfect, dont tear, and peel off the plastic very easy. I found this kind of press at an Asian Market. Pati! Hi! I love your show, your recipes, everything!! I live in Mexico and I always hear about make corn tortillas and i think “why make corn tortillas? its so difficult! !” but you make the way to prepare them so easy.. i have to try!! from Chihuahua, Lily! Dear Patti. Thank you for your shows. We really enjoy watching them and we are looking forward to getting your new cook book. Watching you make some Crullers, which look really good and was wondering where you can get the utensil for making them? Where do I get the corn tortilla flour,, I have tried the mex premixed flour, but it dont work, and regular corn flour, it cracks,, have been trying for years to make fresh tortillas,, ::::??? it has to be the right kind of flour,, can you tell me where to get it???? Harold, you can find it in any Latin grocery store, international store and mainstream stores in their latin or international aisles. Look for Maseca, or any brand that says masa harina, or flour for making corn tortillas. Ask your grocer or try online! Pati, I preheat my skillet for about 8 minutes over medium heat. And, yes, I flip my tortillas twice as you direct. I just made some about 5 minutes ago and none of them puffed up. All feel dry when they come off the skillet, although they do soften up in a tortilla warmer. Thanks for replying so quickly! I just read that you and your family are in the DC area. My family and I live in western Loudoun Co.
Pati, I love your website. Everything I have tried has been amazing – your salsa verde is the bomb! Oh, and thank you for the Rancho Gordo plug. I ordered beans from them and used your recipes for both beans in a pot and refried beans and they were the best I ever had. My question about corn tortillas: My tortillas feel firm when I remove them from the skillet and one side always has cracks, almost like dry clay has cracks. Also, they never puff up or get nice brown spots. I make the dough with Maseca and warm water until I get a soft playdough-like texture. I’m not sure what I am doing wrong. Thanks! Hm… are you flipping your tortillas twice? Is your comal very hot (over medium heat?)? Thanks for your lovely message. Discovered my issue. My medium heat setting was not hot enough. Skillet has to be hotter than I thought. I’m wondering what is the brand of the tortilla press you used on your show. Yours seemed to work very well. I’d like to trying making these at home. Thanks. Me gusta mucho tu programa, gracias por la receta de taco la pastor y de canasta. voy a intentarlos esta noche espero que me quede bien.